Over the next several weeks I will be looking at each team in the NHL from an analytical perspective. What they did well, what they did poorly and what players contributed to their success (or failure). Teams will be reviewed in the order of which they finished. That should please Toronto Maple Leaf fans as they are up first. The Maple Leafs did what they set out to do, finish last. They will be picking first in the upcoming draft and will likely choose Auston Matthews. There are a few who think they may shock the world and take sniper Patrik Laine, but that is a long shot at this point. No matter what, they will be picking up a player who will immediately have an impact on the NHL roster. Do the numbers reflect a last-place team? Let’s take a look. All statistics are while playing 5-on-5 unless stated otherwise. Stats courtesy of corsica.hockey and war-on-ice.com. Let’s get the basics out-of-the-way as they certainly fit the profile of a last-place team. Only two teams scored fewer goals than the Toronto Maple Leafs this season and only five teams gave up more goals. They have the second-lowest power-play-% in the NHL as well. The penalty-kill, on the other hand, wasn’t awful. They finished 13th in the NHL killing penalties. The execution and the finish simply wasn’t there for the Leafs this season. That doesn’t necessarily mean the system in place was a bad one, they just didn’t have a roster that had a legitimate shot at competing. In terms of raw CorsiFor%, the Maple Leafs finished the season 13th in the NHL with a 51.3 CorsiFor%. Pretty respectable in that area and they were one of just four teams who finished in the top 16 in CorsiFor% that didn’t make the postseason. A big issue for Toronto was their complete inability to score at even strength. Their 120 goals were second-lowest in the NHL, a stat that certainly wasn’t helped by a horrific shooting-percentage. At even strength they scored on just 6.4% of their shots, a full .2% lower than the next-worst team. Were they shooting at an unsustainable-low rate or was that actually the appropriate shooting-percentage that roster is capable of? The Leafs lost a lot of games. When you’re behind that often, your CorsiFor% is going to start to tick upwards because the team that is beating them will sit back a little bit. With that being said, the possession numbers for Toronto is still quite respectable considering the team that was on the ice every night. They still managed to be 15th in the NHL in score-adjusted CorsiFor% and once again were one of four teams in the top 16 who didn’t make the postseason. For most of the season, this Toronto team generated a bunch of chances. They finished fourth in the league in ScoringChancesFor per 60 minutes and 10th in the league in overall ScoringChancesFor%. If they add more natural goal-scorers to the lineup next season, it isn’t outlandish to think that this team could compete for a playoff spot. The numbers they generated despite the roster they had was quite impressive. The future is definitely bright in Toronto. The youth movement was sparked later in the season for the Maple Leafs and it likely went better than many expected. Players like Zach Hyman, William Nylander and Nikita Soshnikov were able to step in and give Toronto a glimpse of what life may be like next season. Considering the situation these players were thrust into, I’d say they did pretty well. With that influx of youth, combined with injuries throughout the year, Toronto had a tough time getting consistent lines together. Everybody played with everybody. 15 different trios played at least 50 minutes together this season. One of those trios performed really well in a small sample size and they are some intriguing names for next season. Hyman, Nylander and P.A Parenteau. As of now Parenteau doesn’t have a contract for next season but the Leafs would be smart to bring him back in. There has to be at least a handful of veterans on that roster and Parenteau looks to be an excellent fit. He was Toronto’s best even-strength scorer with 28 points this season. 20 of those points were primary points (goals or primary assists), also tops on the team. He formed a nice bond with Hyman and Nylander late in the season as that line territoriality dominated their opponents regularly. Their 59.81 CorsiFor% was the highest among any other trio that played at least 100 minutes together in Toronto. While that trio split goals against and goals for when they were on the ice (3 and 3), they played better than that showed. That line had an ExpectedGoalsFor (xGF) of 4.83 and 2.71 xGA. You can read more about the Expected Goals model here. That group was fantastic and it makes you wonder what would have developed had they been together earlier in the season. The defense-pairings of Toronto tell an interesting statistical story. You ask any Leaf fan and there isn’t much question on who the future leader of the blue-line is. It’s Morgan Rielly. He was fifth on the team in even-strength scoring and first among defenseman. His possession numbers don’t jump off the charts and a big reason for that is being paired with Matt Hunwick for a majority of the season. Hunwick was a drag. Together, Rielly and Hunwick played 727 minutes together and posted a 47.88 CF%. Hunwick played 300 minutes without Rielly on the ice and posted a 45.82 CF%. Meanwhile, Rielly played almost 700 minutes without Hunwick and put up a respectable 52.05 CF%. Rielly is the future, he just wasn’t part of the best defensive pairings on the team this season for a significant length of time. He and Jake Gardiner formed a formidable pair at times but they were rarely on the ice together (just under 67 minutes this season). Surprisingly, one of the best (statistical) pairings for the Maple Leafs this season was the pairing of Roman Polak and Martin Marincin. They made up a 54.9 CF% in just under 340 even-strength minutes together, by far the best on the team who played significant minutes on the ice together. They were one of the only pairings to post a positive goal-differential and had the second-lowest xGA per 60 out of any pairing that played at least 50 minutes together. They certainly aren’t flashy but they were able to move the puck effectively for the most part this season. This one is pretty easy to break down. Only one goalie in Toronto was willing to make saves and he is currently in California so that the Leafs could draft first. What? You want more? Alright, fine. James Reimer was far-and-away the best goalie Toronto had this season. 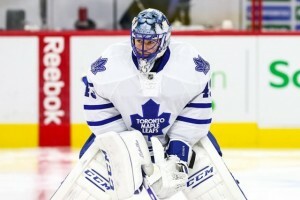 His 93.78 Sv% was miles ahead of both Jonathan Bernier (91.28 Sv%) and Garret Sparks (89.86 Sv%). Reimer put up a 89.95 Sv% against high-danger shots which was significantly ahead of the rest of the NHL in terms of goaltenders who played significant minutes. While Reimer was excellent at stopping the shots he “wasn’t supposed to”, Bernier and Sparks were not. Judging by shot distance, Bernier and Sparks had expected goals against of 67.66 and 28.09, respectively. Bernier let in 78 goals while Sparks let by 37 himself. Both Sparks and Bernier faced a much high average shot distance than Reimer but were unable to come up with consistently quality saves. Toronto can hit the NOS on this rebuild this offseason. If everyone’s dreams come true and they do end up bringing in Stamkos and Matthews, this team has the forward group to jump-start this process and make a lot of progress towards the postseason. We will really see what the mindset of Toronto is based on what they decide to do in net. If they go with a Bernier and Sparks tandem, that likely signals they aren’t making a serious run at the playoffs. If, however, they bring back a guy like Reimer, all bets are off. While adding Stamkos, Matthews and Reimer certainly doesn’t make Toronto a Cup contender, it does vault them into the playoff discussion in the questionable Atlantic Division.